On June 19, 2016, Mumbai had its first 12 hour-stadium run. The inside lanes of the track at the city’s University Ground, were reserved for those running alone. Lanes further to the outside were for teams running the event in relay format. Among those running in the inside lanes was a young man, still a long way off from runners’ wiry build. He wasn’t one of the favorites; there were those better accomplished and looking the part, in the field. He compensated for his shortcomings with a committed work ethic. He kept at his task, steadily chugging along. By evening with an hour or so left for the allotted 12 hours to end, the others allowed themselves to relax but he appeared to sustain his pace lapping up as much mileage as possible. We left it there. At night, browsing race results, we found that the hard work of the concluding hours had paid off. He had finished third logging 99.2 km in 12 hours. Mid-April, we were at a café in Chembur, Mumbai. “ Three years ago I was 95 kilos,’’ the youngster before us said. Given a big waist size he was finding it difficult to get a suitable pair of jeans. He realized he had to do something about his predicament. He started playing football at the RCF ground near where he stayed; he also began a daily regimen of exercises and subscribed to a strict diet. This brought down his weight a bit. Balan, who was the football coach, told the youngster that his future prospects in football seemed bleak but maybe, he should try distance running. Accordingly, around July 2013, he started running. It was tough initially; his knees hurt and his running form (posture) wasn’t good. But he persisted; slowly raising his daily mileage to ten kilometers. Balan introduced him to a routine of strength training that would stand him in good stead as aspiring runner. “I still do the exercises he taught me. All natural stuff, no visiting the gym,’’ the youngster said. Not just that, he found that he liked strength training. To this end, he also did much browsing on the Internet, looking for exercises that would help him. After participating in some of the smaller running events he took part in his first half marathon – the Varsha Half Marathon held at Thane, near Mumbai. “ It was very tough for me but I managed to complete it in about two hours. I was totally exhausted after that race,’’ he said. It left him wanting to quit running. He thought about it. Then as before, he decided to stick with what he had begun. Although he trained through November-December of 2013, he failed to register for the 2014 Standard Chartered Mumbai Marathon (SCMM) because he didn’t know how to register. He couldn’t figure it out. He confessed to a wrong doing – he ran SCMM using another runner’s bib (running with another’s bib is forbidden). He said he completed that full marathon in 4:02. This was followed by the Thane Hiranandani Half Marathon, which he finished in 1:52. In August 2014, he ran the 12 hour endurance run called the Mumbai Ultra (it is different from the stadium run), covering 86 km. He also did a full marathon in Hyderabad, repeating the wrong he committed earlier – he ran on someone else’s bib. He closed that year with the Vasai-Virar full marathon, completing the race in 4:13 hours. By now, he had developed an appetite for running. “ My grandmother would tell me to focus on my studies. I would go for a race saying this is my last race and so on,’’ he said. His grandmother matters much to him. For the runner in the making, parents were grandfather and grandmother. Between the 2014 full marathon in Hyderabad and the one later in Vasai-Virar his life in running took a turn. While the Mumbai Ultra is a fully supported non-competitive event in which runners pile up as much mileage as they can, he ran the 100 km-category of the Nilgiris Ultra, finishing the race in 12 hours 23 minutes to place fifth. 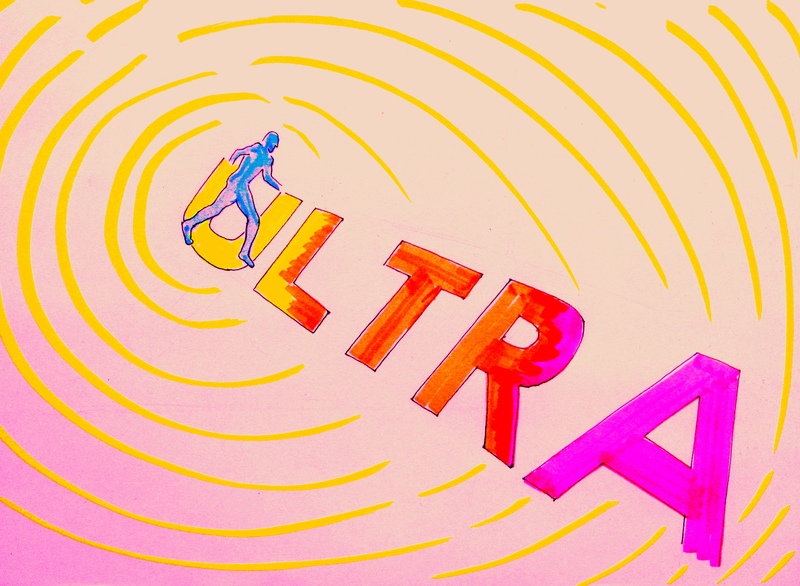 Ultramarathons differ from marathons and half marathons in many ways. There is the obvious difference in distance covered. By definition an ultramarathon exceeds the length of a marathon. That excess is however only the beginning of ultramarathon distances. They can range anywhere from in excess of marathon length to 100 miles (160 km) and multi-stage races wherein runners do marathon lengths and more back to back for several days. Some of these races are supported; some are not wholly supported, requiring the runner to carry a small pack bearing essentials. Some have set routes following roads, trails or paths; some require the runner to navigate. Some ultramarathons are big affairs with many people participating. Some are secluded events that see few people participate. Unlike marathons, usually set in cities and now almost an urban fad, ultramarathons are typically associated with interesting terrain and scenery. Interesting terrain may also mean challenging terrain. In locales like Rann of Kutch and Ladakh in India, you not only endure distance but also temperature and elevation change. It is often said in climbing that climbers begin with rock climbing, which is fueled by youth and then transition to mountaineering. Nature and the multiple challenges posed by nature, make mountaineering wholesome. Age is a much respected ingredient in this transition. Ultramarathons have for long been the bastion of a senior lot. Can you be young and experienced enough for the ultramarathon? In Mumbai, Inderpal Khalsa, the young man who others feel is in a hurry to get somewhere, divides the running community. 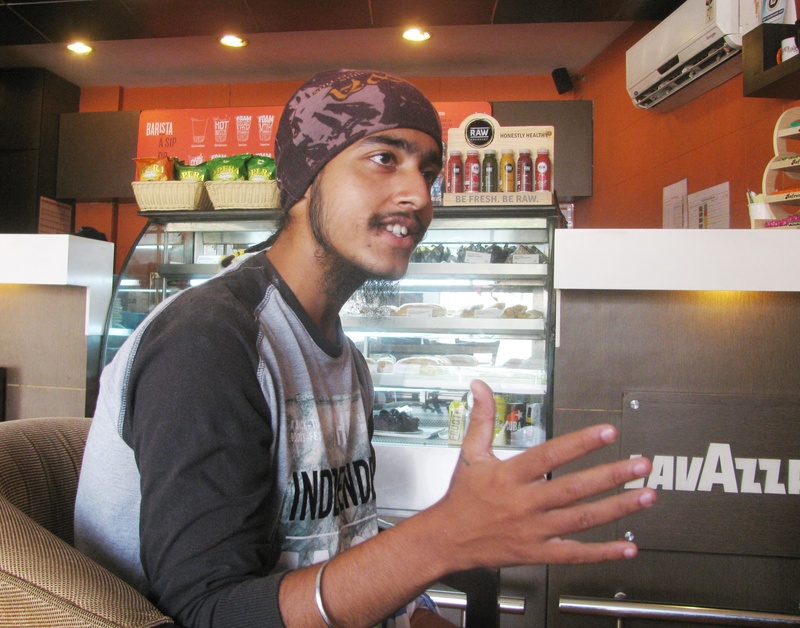 Born November 1994, he was 21 years old that day at the café when he spoke of his life and in it, the Nilgiris Ultra. That ultra was his first proper ultramarathon. In his head, it set something in motion. Distance appeared his forte. “ I have a fascination for distances,’’ he said. He counted on social media to locate interesting races. The Nilgiris Ultra was discovered so. 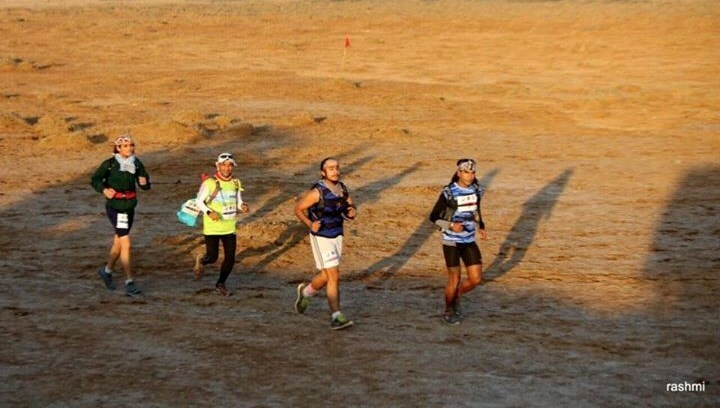 In February 2015, Inderpal ran a 100 miler (160 km) in the Rann of Kutch. He trained for it in Mumbai, running at Juhu, hydration pack strapped to his back. The Rann of Kutch (it is one of the biggest salt deserts in the world) was challenging environment; during day it would be hot, by night it turned cool. It took Inderpal 31 hours to complete the race, which was called Run of Kutch. He finished first in the open category. Soon after the race in Kutch, Inderpal went to Manali with fellow ultramarathon aficionado, Kieren D’ Souza. The two had met at the 2014 Nilgiris Ultra where Kieren finished fourth and Inderpal, fifth. “ We did trail running in the mountains around Manali. It was part of preparations for a race I was due to participate in,’’ Kieren said when contacted. This trip to Manali was just after Inderpal’s exams. By then running was pretty much life for the college student. He maintained his regimen of strength training, attended classes and ate only food that was appropriate for the running he had embraced. 2015 was Inderpal’s defining year. It kicked off with the earlier mentioned race in the Rann of Kutch. This was followed by the Manali trip and a barefoot-run of 80km in 11 hours, done for the fun of it, mainly to see how well he could run barefoot. “ While I enjoyed this run, getting started in barefoot running was quite tough. I had to cope with a lot of blisters,’’ he said. Then an opportunity to be part of an inter-city run emerged. Satish Gujaran, among Mumbai’s best known ultramarathon runners, was running from Mumbai to Surat. Inderpal joined him as a support runner. Due to difference in pace and gaps opening up (it makes the job of the support vehicle difficult) Inderpal didn’t run the entire distance in a continuous, unbroken fashion. 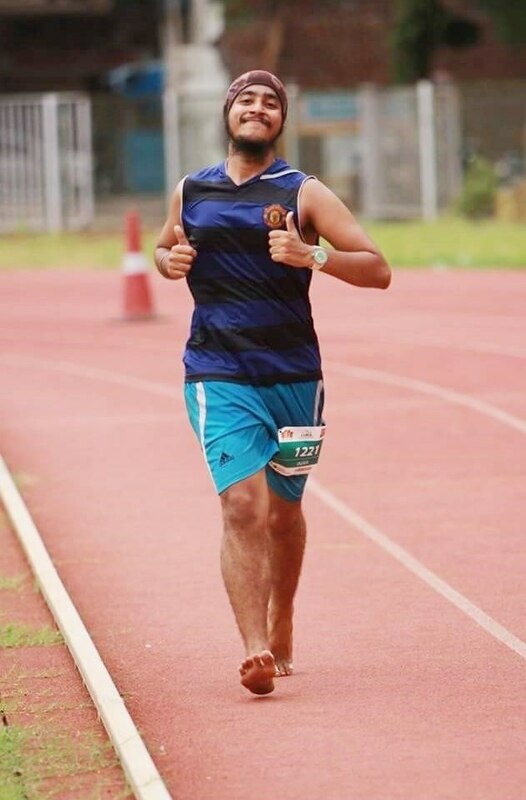 Following this outing, Inderpal ran the 24 hour-stadium run at the Kanteerava Stadium in Bengaluru (running barefoot he covered 136 km) and the Mumbai Ultra (where he covered 80 km in 12 hours). At the Bhatti Lakes 100 miler (160 km), he ran the distance in 31:08 hours placing third. “ This was a challenging run. It was very hot and my skin was burning,’’ Inderpal said. November 17, 2015, marked his twenty first birthday. He said he celebrated it with a 20 hour-walk in Mumbai. Among marathons that year, he ran the Hyderabad Marathon and the Vasai-Virar Marathon. 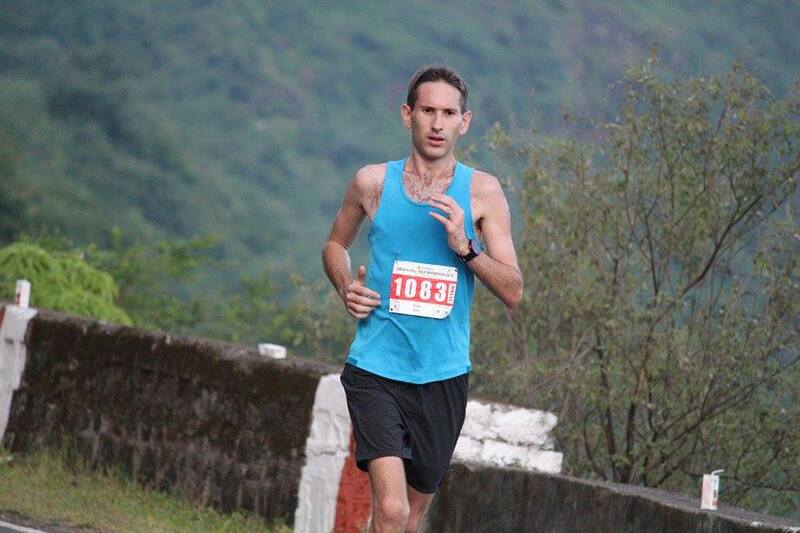 He wrapped up 2015, running the Western Ghats Ultra in Pune. Inderpal couldn’t complete the race. “ It was very tough,’’ he said. In January 2015, when Inderpal was preparing for his run in the Rann of Kutch, an IT professional, roughly ten years older, participated in the first running event of his life – a 10km race in the Mumbai suburb of Powai. Born 1985 in Rajasthan, schooled in Karnataka and working with Tata Consultancy Services (TCS) in Mumbai, Jayaraman Rankawat had never been into sports before. In fact, during his days in school, he was among the timid who got bullied. Life in Mumbai with its annual SCMM got him interested in running. He took 90 minutes to complete that Powai run. “ For the next couple of days I was in pain,’’ he said this June, at a café near the Airport Road metro station not far from Andheri. However the pain made him think – had he practiced and run, wouldn’t the pain have been less? He started going for all 10km runs he could find. In February 2015, the month Inderpal went to Rann of Kutch, Jayaraman ran his first half marathon in Thane, finishing the race in 3:15. Searching on the Internet for people he could connect with in running, he found Sharmila Munj and the organizers of Pinkathon (a running event focused on getting more women into the sport) now held in several Indian cities. He started running with them in Juhu. In April 2015, he found himself at a non-competitive event called `United We Run As One.’ There, he saw among the many runners assembled, Mumbai’s well known running couple – Sunil and Sangeetha Shetty; they were wearing T-shirts from the Bengaluru Ultra. “ I went home, searched for the event on the Internet and when registration commenced, registered for the 100km race at the Bengaluru Ultra,’’ he said. In August, Jayaraman ran the 12 hour Mumbai Ultra. In the allotted 12 hours, he managed to cover 62 km. “ The Mumbai Ultra gave me confidence to face the Bengaluru event. If I can be on my feet for 12 hours, I figured I should be able to be on my feet for some more hours and complete 100 km on foot,’’ he said. Within days of the Mumbai Ultra, Jayaraman went to Hyderabad and ran a half marathon there finishing it in under-2:45. Back in January, although he wasn’t running the SCMM, he had visited the race expo and the stall put up there by the organizers of the Ladakh Marathon. In September, after ensuring some dedicated preparation for the event and reaching Leh a week in advance to acclimatize, he ran the half marathon there, completing the run in around three hours. “ It was tough,’’ he said of the effect of altitude. Next month, his monthly mileage in Mumbai was about 350 km, making him winner of a “ challenge’’ issued by some local runners. In November, he ran 100 km at the Bengaluru Ultra, taking approximately 19:30 hours to complete the distance. “ The last 20 km I walked,’’ he said. Later in November, he ran his first full marathon at Vasai-Virar, finishing it in roughly six hours. 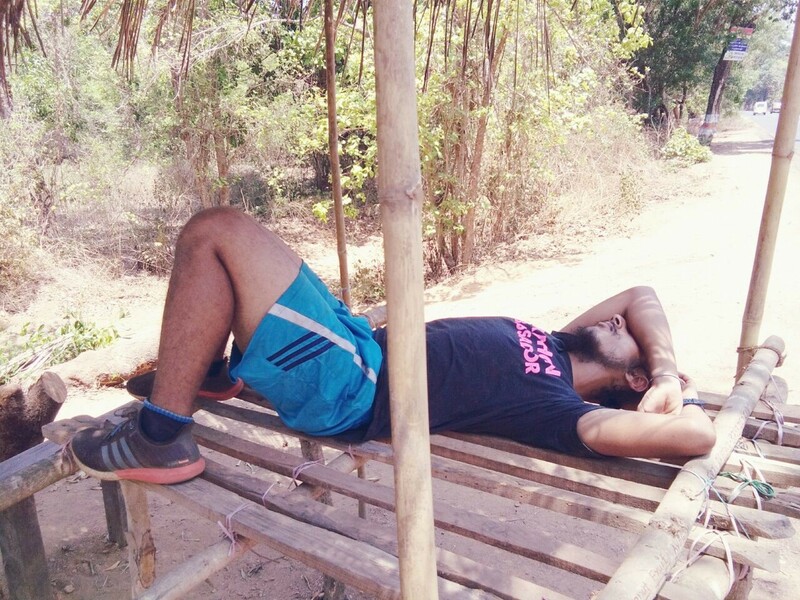 Then he followed it up with the Goa River Marathon in December, completing the race in 6:30. In January 2016, he ran the full marathon at SCMM in 6:20. “ I spent a lot of money in 2015 traveling to run at 26 timed events in different locations,’’ he said. One of the friends he acquired in this haphazard journey through a clutch of distances was Inderpal Khalsa. 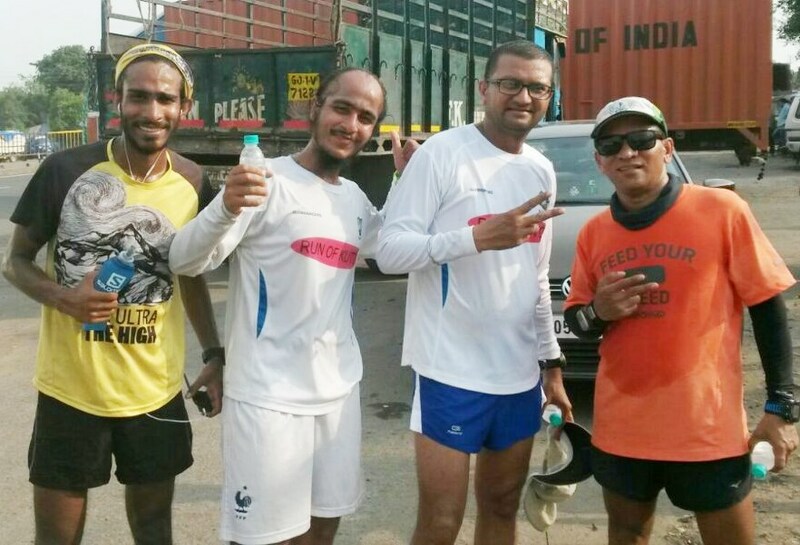 Their paths crossed at the Mumbai Ultra and again, at the Bengaluru Ultra and the Vasai Virar Mayors Marathon. 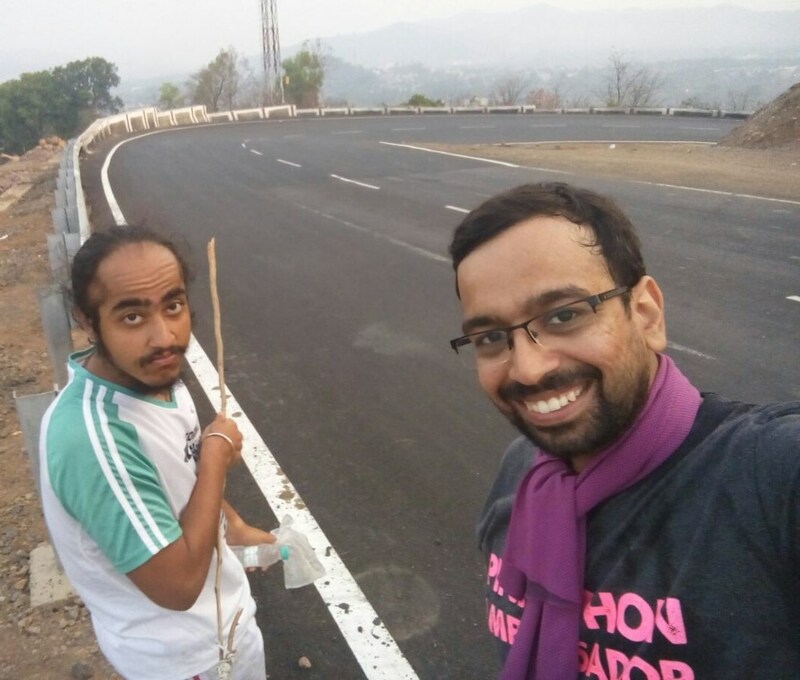 In February-March 2016, two runners from Bengaluru – Spoorthi and Giridhar Kamath – ran from Bengaluru to Hyderabad, in connection with a Pinkathon event that was due in Hyderabad. A similar event was scheduled in Goa in April. It set Jayaraman thinking: why not run from Mumbai to Goa? He floated the idea on Facebook, asked if anyone was interested. Inderpal responded. They discussed the project with actor and runner, Milind Soman and the Pinkathon team. 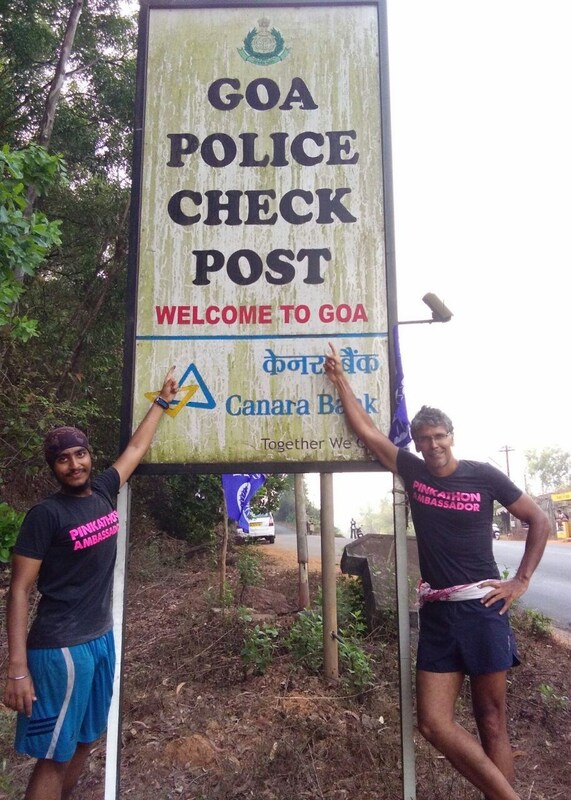 On April 6, 2016, Inderpal and Jayaraman started their run from near Mumbai’s Siddhivinayak Temple. Days on the road began at 6.30 AM. On April 15, some 600km covered and ten days after they left Mumbai, they reached Goa. Milind ran with them on the first day, the third day and the last two days. Future plans for Inderpal included, a run in August from Lucknow to Delhi, a yet to be finalized run from Mumbai to Nagpur, a 36 hour-stadium run in Bengaluru and a 135 miler (220 km) in Uttarkashi. “ After Kutch and Bhatti I can run in any weather,’’ he said confidently. His dream is to run the Badwater Ultramarathon in the US and the Spartathlon in Greece. Both Badwater and Spartathlon are coveted races, usually aspired for by really good and experienced ultramarathon runners. Much before we met Inderpal, we picked up the observation about him in Mumbai’s running circles: he is doing too much, too early. “ I think that at least till the age of 30, he should gather experience running half marathons and full marathons. Ultramarathons need you to know yourself well. That, and maturity, come only with age and experience,’’ a seasoned senior runner in Mumbai with appetite for the ultramarathon, said, adding, “ what is the guarantee that 20 year-old running ultramarathon distances now will continue doing so?’’ It is a valid point. Instances like being pushy to further his chances, maybe even those episodes of running on others’ bibs – these have reportedly left some in the running community questioning the young man’s ways. The Mumbai-Goa run also fetched its share of critics. Although there were regular updates on the Internet about the progress of the run, the duo failed to properly plot their passage on a GPS. Proof matters where peers are involved. “ Except for the Pinkathon team, nobody from the established lot in the running community appreciated us for our effort,’’ Jayaraman said. Like Inderpal, he is physically on the heavier side but with the ability to hang in there on long journeys; that tenacity was evident at the 12 hour stadium run of June 19, where the duo and Milind were present. Asked what he thought of his slow timing at the half marathons and marathons he ran and why he had approached running in such an unplanned fashion, Jayaraman said, “ I am interested in running free. I don’t want excess technical information; I don’t want something planned as per the books.’’ As he put it, he already has the structured approach in corporate life. 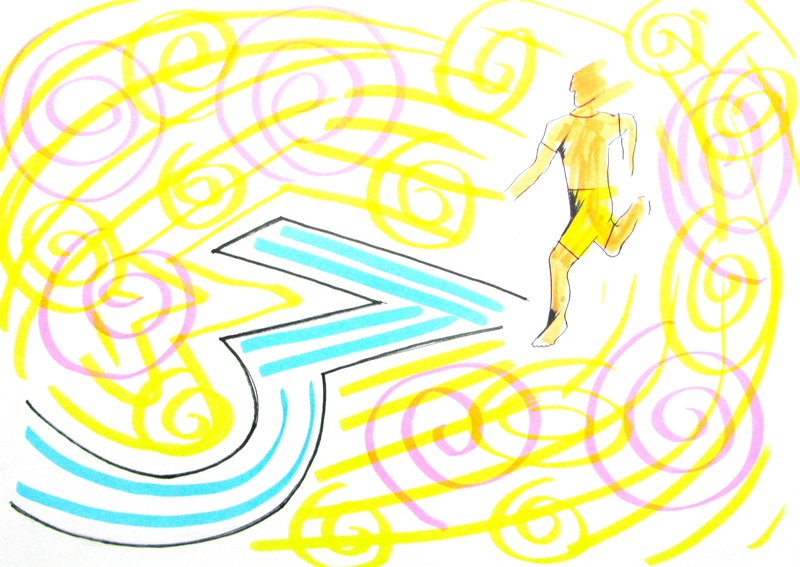 Running, on the other hand, is something “ I chose.’’ Why make both similar? He regrets the vanishing element of exploration and fun. We decided to explore the issue of age and structured approach to the ultramarathon, some more. In India, the story, which immediately comes to mind in the context of young age and long distance running, is that of Budhia Awooga Singh who at the age of four ran from Bhubaneshwar to Puri, covering the distance of 65 km in seven hours and two minutes. He earned a mention in the Limca Book of Records. Wikipedia’s page on Budhia says that by the age of four, he had run 48 marathons. Although fame by media and sponsorships piled up, Budhia’s marathons were banned by the state on the advice of the Khurda District Child Welfare Committee. In a later submission before the Odisha High Court, the state cited potential early onset of osteoarthritis and burnout among reasons for the ban. In September 2007, Budhia was admitted to a sports hostel of the Sports Authority of India (SAI). An April 2016 report in The Indian Express pointed out that Budhia, now 14 years old, wasn’t enjoying his stint at the sports hostel for a variety of reasons; one of them was that he had been shifted to running middle distance races, which are faster and don’t tap into the endurance he had displayed originally. While the hostel coach declined comment, the report mentioned Surender Singh Bhandari – as coach, he mentored Nitendra Singh Rawat, Kheta Ram and T. Gopi, who have all qualified for the marathon event at the 2016 Rio Olympics – as saying that Budhia needs to wait it out. According to him, the Indian body develops slower compared to foreigners and if Budhia were to start running marathons again at 14, not only may some of his old injuries act up but he may become burnt out and injury prone by the time he is 20-21 years old. In the report, Bhandari, who believes that the ideal age for Indians to start training for the marathon is “ after 20,’’ says that the apt thing for Budhia now would be to stick to middle distances so that he is in touch with running and can build up his body, speed and stamina. In 2006 – the same year Budhia gained entry into the Limca Book of Records – a train of events was unfolding some 15,000 km away. Sample this account from those overseas incidents: Jenny and Billy had only started running two years before, but Billy was already winning some of the toughest 50ks on the East Coast, while “ the young and beautiful Jenn Shelton,’’ as the ultrarace blogger Joey Anderson called her, had just clocked one of the fastest 100-mile times in the country. These lines are from the book ` Born to Run’ by Christopher McDougall. Preceding the above description of the two runners McDougall was to meet at the airport in El Paso, Texas, is their introduction: I was pretty sure I was wasting my time, but there was a chance I’d be picking up Jenn “ Mookie’’ Shelton and Billy “ Bonehead’’ Barnett, a pair of twenty-one year-old hotshots, who’d been electrifying the East Coast ultra circuit……In the book, 21 year–old Jenn and Billy, all of two years into running then, are among those who eventually race with the Tarahumara in Mexico’s Copper Canyon in running’s most loved ultramarathon story. A decade after the ultramarathon at the heart of ` Born to Run,’ Wikipedia’s page on Jenn Shelton says that she now finds marathons more challenging to run than the ultramarathon. Shelton, who competed in the 2012 US Olympic Marathon Trials (but did not finish due to a hamstring injury), has said that she intends to run more marathons and shorter races, citing a desire to run faster races, the page said. Which of the above suggestions / patterns do you go with? In the US, running became the movement it is, in the 1960s and 1970s. Europe followed. A mere 24 years separates the start of the world’s oldest marathon (1897 – Boston Marathon) and the world’s oldest ultramarathon (1921 – The Comrades). However, compared to the visible popularity of the marathon by the early decades of the second half of the twentieth century, ultramarathons became similarly known later (the International Association of Ultrarunners (IAU) was founded in 1984; it was recognized by the International Amateur Athletics Federation in 1988). This likely meant that those running in the early flush of popularity enjoyed by the marathon would have advanced in years by the time the ultramarathon became popular. The ultramarathon filled a niche experience some of them were seeking in their progression through life and running. It is possible that the well-entrenched description of the ultramarathon runner as a middle aged mature individual, owes much to this demographic transition. Does it mean only that age group qualifies for the ultramarathon? What complicates matters is that a correct apples-for-apples-comparison is hard to find for the variables are many. There are personal variables, generic variables, variables based on whether your expectations are competitive or recreational etc. One approach would be to work back from the perspective of risk. At a running event – like an ultramarathon – nobody is shouldering as much risk as the event organizer. When things go wrong the event manager faces the heat. Some of the world’s leading ultramarathons require that applicants should have run comparable races before; they also enquire about applicants’ overall experience in the sport. Dr Rajat Chauhan is the Delhi based-organizer of La Ultra-The High, a tough high altitude ultramarathon held every year in Ladakh. Asked if the twenties are too young an age for the ultramarathon, he said that age by itself is not the problem. “ Runners should gradually build up. Injuries happen if you are not careful. There is a very simple observation in sports medicine – the vast majority of injuries happen because you are doing too much, too soon,’’ he said. What makes the Indian context fertile for injury is competition, the need to prove, the `challenges’ proliferating on social media – in other words, the many distractions diverting attention from personal journey. What if Dr Chauhan is faced with a 20 year old applying for an ultramarathon? It is, he said, a matter of the organizer being adequately convinced. “ I will study that individual’s application very closely. I have zero issues if he is capable of running a given ultramarathon,’’ he said, adding a lot of “ back and forth’’ in choice of race (ie in terms of distance elected to run) and creative running outside the traditional formats of 21 km and 42 km are bound to happen in India too. That even unplanned approaches to running explore the opposite side (in this case, the more ordered side) was evident in Jayaraman’s transition – against 26 timed events run in 2015, in the first half of 2016, he did only three. According to Inderpal, he doesn’t dwell much on whether he is running too much, too early. He reposes faith in his youth and exercise routine. Besides the strength training he has been doing, he also does yoga. Some of this confidence – irksome to those advocating a slower progression in running – may be rooted in age. At the same time, it was clear that whatever he was doing was rubbing off on the young man. “ It is a different high that you get when running an ultra. It is meditative. The sleep that follows a long run is utterly deep. Once every two months, if I am not running an ultramarathon, I feel something is missing,’’ he said. Inderpal’s parents divorced when he was very young, when he was yet a child. He said he has never seen his father. His mother, who remarried, made efforts to reconnect in his adolescence. But he related to her as though to a stranger. “ It is difficult to suddenly feel close to someone who wasn’t there for you in your growing up years,’’ he said. For all matters concerned, the grandparents who looked after him were his family. Those familiar with the situation said that the grandmother stepped in to stabilize the remains of a marriage gone wrong and brought up Inderpal and his brother, like her own children. They lived in an apartment in Chembur; a joint family, which also included two of Inderpal’s uncles and their families. The brothers navigated their way through the rough and tumble of life. Their grandfather passed away sometime back. Running has given Inderpal identity and belonging. He said he likes the ultramarathon community. It is way smaller in size than the huge army of regular runners out there and because the ultramarathon world is a smaller community, its races are smaller affairs; its denizens know each other. “ In every ultramarathon, every race, I learn something new,’’ Inderpal said. When we met him, he had just finished his graduation and applied for a MBA in sports management. The yoga bug had also got to him and he wondered if he would be able to open a yoga institute at some point in the future. Finally, there were those sandals which the young man makes and he had brought in his bag to show us. They looked like running sandals, the sort you find mentioned in `Born to Run.’ The ones we beheld at the café were made of leather sourced from Dharavi, the city’s hub for locally made leather goods. They seemed their part – minimalist sandals that reminded of running. “ You can’t run in these sandals but you can use them as casual wear,’’ he said, his product pitch tinged with hope. The café near Kaloor in Kochi had just opened for the day. But there was no hesitation over whether to serve a customer arrived early or not. I chose a table, ordered a cup of tea and waited for the subject of this article. On Wikipedia, the page for Infosys says that the company had 194,044 employees as of March 2016. “ Back then I was employee number 342, based in Bangalore,’’ Ramesh Kanjilimadhom said of his first job. Brief introduction aside, we had wasted no time in starting a conversation. Those were the pre-IPO days of Infosys; it was yet to become the household name synonymous with information technology that it would be in the years following IPO with shares listed and traded. Ramesh worked with Infosys over 1992-1993, then he joined Wipro GE Medical Imaging Systems. He left that in 1995 and shifted to the US, where he became part of a small company called Beechwood Data Systems in New Jersey. Until then, life had been relatively predictable, straightforward. He was born 1969 in Varandarappilly, a town near Thrissur in Kerala, to parents who were teachers; his father taught Malayalam at a college, his mother taught Malayalam at a school. “ I never thought of myself as an athlete. I played cricket in school – that was it. My grandfather was a temple priest, my father was into literature – it was a highly literary household that I grew up in. There was no inclination towards athletics. I felt I wasn’t cut out for it,’’ Ramesh said. His schooling spanned three towns: Varandarappilly, Irinjalakkuda and Kothamangalam, leading up to a degree in engineering (Computer Science) from the Government Engineering College in Thrissur. Employee number 342 at Infosys was soon after that. In the late 1990s, Ramesh’s elder brother was diagnosed with diabetes. Around the same time, his mother too was diagnosed with diabetes. When Ramesh went for his annual medical check-up, his doctor recommended that he do something to avert what appeared to be a genetic disposition in the family. Ramesh started running in Fairfax, Virginia; his daily mileage was 7-8km. He built it up to 12km once a week. “ It was hard finding the motivation to do this,’’ Ramesh said. Luckily for him, Salvatore Messina, his boss at Beechwood was a marathoner. He encouraged Ramesh to try longer distances. `Sal’ was passionate about the Marine Corps Marathon (MCM), held every year on the last Sunday of October, in Washington DC. The event begun by the US armed forces in 1976, is currently deemed the sixth biggest marathon in the US and 12th biggest in the world. Egged on by Sal, Ramesh enlisted for the 2006 MCM. He signed up six months ahead. For preparation he ran a local 20km race and also a 21km race. “ At MCM there is something called ` Beat the Bridge,’ which is basically a bridge 32km into the race that must be crossed in 4-5 hours. I was aiming for a four hour-marathon. On the bridge I hit the proverbial wall and cramped up,’’ he said. Nevertheless, he completed the first full marathon of his life in 3 hours 47 minutes. Sal was sufficiently impressed by it to tell Ramesh that perhaps he should try the Boston Marathon. Ramesh didn’t take the suggestion seriously right then; instead he pursued the idea of a marathon in 3:30 and registered for the Carlsbad Marathon near San Diego in California. This was tougher than MCM. It was a hilly course. He finished in 3:46. “ That second marathon taught me what a marathon entails,’’ he said. Persisting with the goal of 3:30, he then ran the Fredrick Marathon in Maryland. He trained for it. In 2007, he completed the run in 3:33. Now he began thinking of Boston. 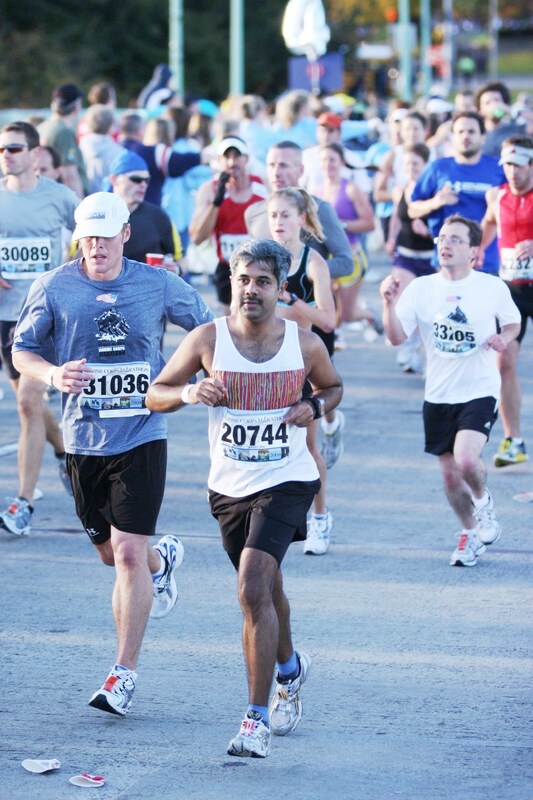 Following that 3:33 at the Fredrick Marathon, Ramesh decided to do a Boston Qualifier (BQ). Those days, the qualifying time for his age group was 3:20. The BQ he chose was a race called Steamtown Marathon, held in Scranton, Pennsylvania. In retrospect, Ramesh thinks it isn’t the ideal BQ, for it is downhill most of the way with the last 3-4km being uphill. “ I would think that ideally a BQ should be flat,’’ he said. The day of the 2007 Steamtown Marathon turned out to be hot. Same day, after the Chicago Marathon commenced, it was cancelled citing the heat. “ I finished Steamtown in 3:28. But I still felt that I can do a 3:20,’’ he said. By this time, further changes had happened at work. Ramesh left Beechwood Data Systems in 2002; Beechwood would eventually be acquired by Capgemini. In 2004, he started a small company in league with his former boss at Beechwood. The company is called Seygen and Ramesh is one of its directors. Seygen develops software for telecom companies. Three weeks after Steamtown, he ran his second MCM and then shifted back to India with Seygen. In India, the company has offices in Kochi and Mumbai. Ramesh keeps traveling to the US regularly, where Seygen has the other half of its operations. 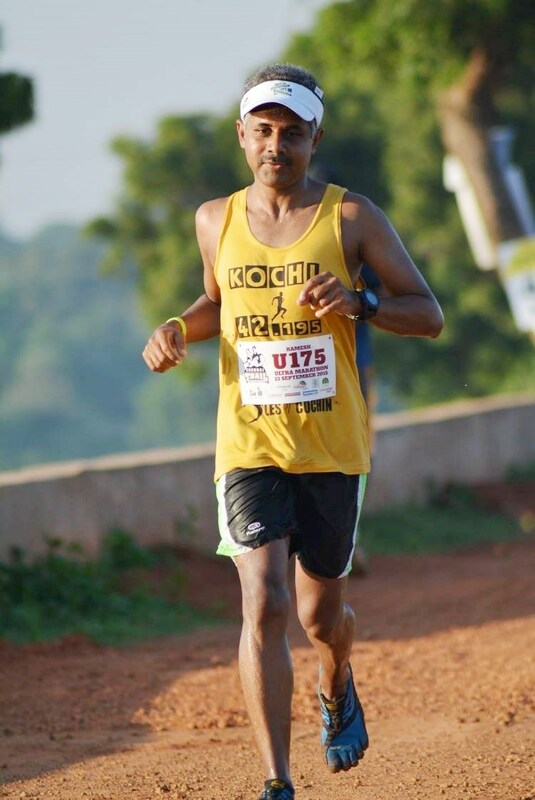 In 2008, not long after returning to India, Ramesh ran his first Standard Chartered Mumbai Marathon (SCMM). He completed the full marathon in 3:36. Same year, he ran the St George Marathon in Utah. “ It is a downhill course and Utah is beautiful. However it was extremely cold and windy, I also reached the venue later than expected thanks to some air travel problems,’’ Ramesh said. He finished the race in 3:28. After the run he was ill, shivering from the cold. He still remembers – the treat for runners after the race in that chilly weather, was an ice cream! Following the Utah event, he ran his third MCM. Three months later, while still searching for a BQ, he found himself with his children at Disney World. There, he ran the Disney World Marathon. It was a flat course, running from one Disney Park to another. Ramesh didn’t like that commercial aspect but he completed the race in 3:09. “ It was the first race I ran without any walking,’’ he said. That year the qualifying time for his age group in Boston was 3:15. Ramesh’s timing from the Disney World Marathon was well within it. In April 2009, he ran his first Boston Marathon. “ It was a wonderful experience. Boston is great because of its spectators. You don’t see even ten metres without spectators. The cheering is awesome. Then there is the Wellesley College portion of the course, which is called the ` Scream Tunnel.’ It is a girls’ college and on race day they offer the runners free hugs and kisses. It is fun. Wellesley College is roughly around the 20km-mark. Between 26km and 32km there is a series of hills called Newton Hills, culminating in Heartbreak Hill. After Heartbreak Hill is Boston College. The Boston Marathon is like a big festival for the residents of the course,’’ Ramesh said recalling a race he evidently loves. He completed his first Boston Marathon in approximately 3:37. The experience seems to have taken a load off his chest, for he says, he settled down thereafter to enjoying his running. “ I began running for the fun of it,’’ he said. Asked if he consciously managed the number of races he ran a year, he said, “ I don’t hold back on races.’’ Ramesh has run 3-4 marathons in a month. When I met him in April 2016, he had already logged 52 marathons and three ultra-marathons. Ramesh went on to run the Boston Marathon in 2010, 2013 and 2015. In 2015, he completed the course in 3:19. That was the year Thomas Bobby Philip from Bengaluru ran barefoot in Boston. “ It was cold! I don’t know how he managed to do that,’’ Ramesh said, appreciating the effort. 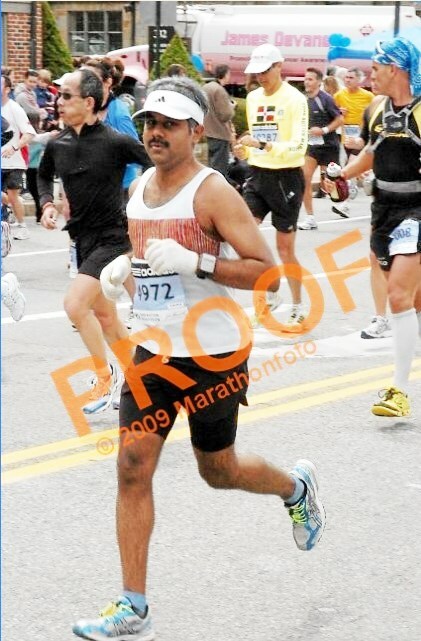 After his first Boston Marathon of 2009, Ramesh increased his mileage. In December 2009, he ran 550km; he said he recovers well after every long run. Roughly eight months after his first Boston Marathon, Ramesh began experimenting with barefoot running. In January 2010, Ramesh ran the Dubai Marathon wearing minimalist footwear. He completed it in 3:05. Since the 2010 Dubai Marathon, the majority of his running has been barefoot. “ I am not an evangelist for barefoot running. How it works, varies from person to person. But you won’t know till you try it. I believe everyone should try it at least once,’’ Ramesh said. The 2012 SCMM was special. Finishing it in 3:14, it was the first time Ramesh qualified for the Boston Marathon in India. Two weeks after that edition of the SCMM, he completed the Dubai Marathon in 3:08. That run in Dubai earned him entry to the New York Marathon of November 2012. In Kochi, Ramesh stays in Kakkanad. Friday, August 10 dawned with heavy rain. At 5.30 AM, the hour Ramesh leaves for his daily ten mile-run, it was relatively dark save for the street lights on the road. “ I try to finish my weekday runs in time to wish the kids before they get on the school bus,’’ Ramesh said. According to a report in The New Indian Express, that day Ramesh was running by in front of the Youth Hostel near NGO Quarters, when a car suddenly appeared from a side road and hit him on his left side. He landed on his face. The car didn’t stop. It accelerated and sped away. Ramesh tried to hold his leg, stand up and go to the nearest junction to get help. He could not. “ The accident broke the tibia and fibula of my left leg. My lower leg was dangling at an angle,’’ he said. As often happens in India, likely fearing the legal hassles that follow getting involved in the aftermath of an accident, no passing vehicle stopped to help Ramesh. Luckily, Rocky Roger, a BPO professional who had just finished his shift and was headed home, saw Ramesh. He stopped his car, picked up the injured runner and reached him to the hospital. X-rays revealed the multiple fractures. The orthopedic surgeon at the hospital, decided to insert a steel rod to hold the fractured bones in place. Seema, Ramesh’s wife who had by then arrived, reminded the doctor of the patient’s love for running. The steel rod was traded for a titanium one. It was surgery, insertion of titanium rod and end of New York Marathon plan for time being. Interestingly, due to a hurricane, the New York Marathon of that year was cancelled. “ I got back the money I had paid as entry fee,’’ Ramesh said. He was on crutches till early November. Mid-November 2012, he resumed running. For the 2013 SCMM, his preparation wouldn’t have exceeded 30km in all. He finished the full marathon in 4:07. I asked Ramesh about the surgery months before that SCMM, and his road to recovery. “The surgery was done only after my wife Seema arrived at the hospital and she alerted the doctor that I was a runner. So he used titanium rod which is lighter instead of the steel that they normally work with. I had the rod, plate and screws for about one and a half years. I ran fine with them. They were eventually removed in March 2014. My passage back to running was rather uneventful. I followed the instructions of the doctor and the physio to the tee. The good thing was the doctor was quite supportive of my running and he wanted me to get back to it quickly; so that helped. I started walking without crutches in a couple of months after the surgery and started running by late November. SCMM 2013 was hard because I had run no more than five to six times in the months preceding it, but it was a big confidence booster. I didn’t have any pain due to the surgery during or after the race, so didn’t have to look back,’’ Ramesh said. In 2013, Ramesh’s friends Prasanna Kumar (aka A.P. 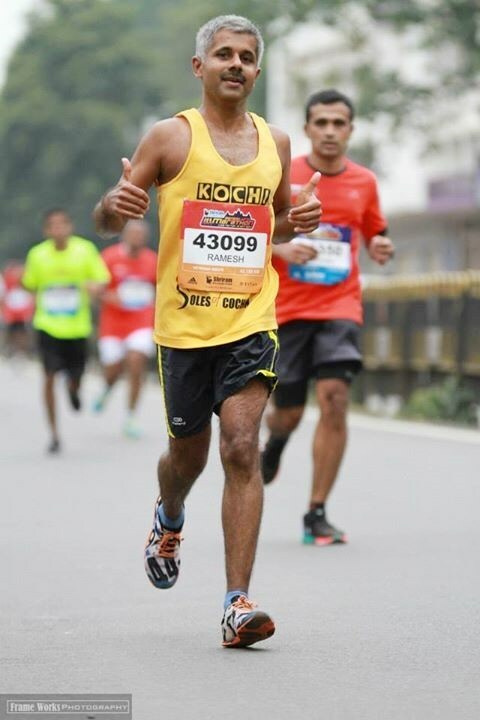 Kumar; based in Kochi) and Manoj Kuriakose (based in Dubai) suggested that they start a running club. While this thought process was on, Ramesh got a call one day from Houston based-Mathew Mapram. He was calling from Kottayam. Mathew was a runner, around 68-69 years old then; he wanted to know what he could do to make running a lifestyle in Kerala. “ That was a spark for the runners around to meet up. We decided to start a running group. Manoj came up with the name: Soles of Cochin. The group started in July 2013 and its growth has been amazing, not just in terms of numbers but also in terms of passion for the sport. We don’t leave out any race anywhere. We just go and run everywhere. We make a lot of noise. We have now become a synonym for being crazy runners,’’ Ramesh said. In Kochi, the group trains four days a week. They have a tempo run on Tuesday; a hill run on Thursday, a long run on Saturday and a beginners’ run plus recovery phase on Sunday. “ We have supported long runs but nothing like Mumbai Road Runners’ monthly Bandra-NCPA run in Mumbai. We want to get to that level though,’’ Ramesh said. However Soles of Cochin has three full-fledged events that it organizes. In January, it holds the Puttumanoor Race (21km, 10km, 5km), in May it holds the Spice Farms Race (21km, 10km, 5km) and in November, it conducts the Spice Coast Marathon (42km, 21km, 5km). In between, it also organizes trail runs in Munnar, Vagamon and Lower Periyar. Two weeks before I met Ramesh, Soles of Cochin had organized the Night Owls Ultra, a 12 hour-run at night on Willingdon Island (home to Kochi’s port). “ We want to do it more often. Maybe do it in monsoon; March was hot,’’ he said laughing. At the 2015 Mumbai Ultra (a supported non-competitive 12 hour-endurance run held annually in Mumbai) I met Naushad Asanar and Vijayan Pillai, both Kochi based-runners and members of Soles of Cochin. According to Naushad, Ramesh, who is much respected in Kochi’s running scene, prefers to keep a low profile. He sports a simplicity acquired from years of running. “ He is not crazy about gear. At the events we organize, he plays his role but stays in the backdrop. Others may pitch to invite celebrities for a running event to create some buzz. Ramesh is rarely part of such trends, for him running is what matters,’’ Naushad said, adding, that simplified, functional view of running has influenced the group. “ We see Ramesh as a guide. He has done a lot of running, yet he is humble. Although someone who shuns the limelight, he is a very open person and newcomers to the sport learn much talking to him. If you go for a run with him, his love for the sport rubs off on you,’’ Vijayan said. 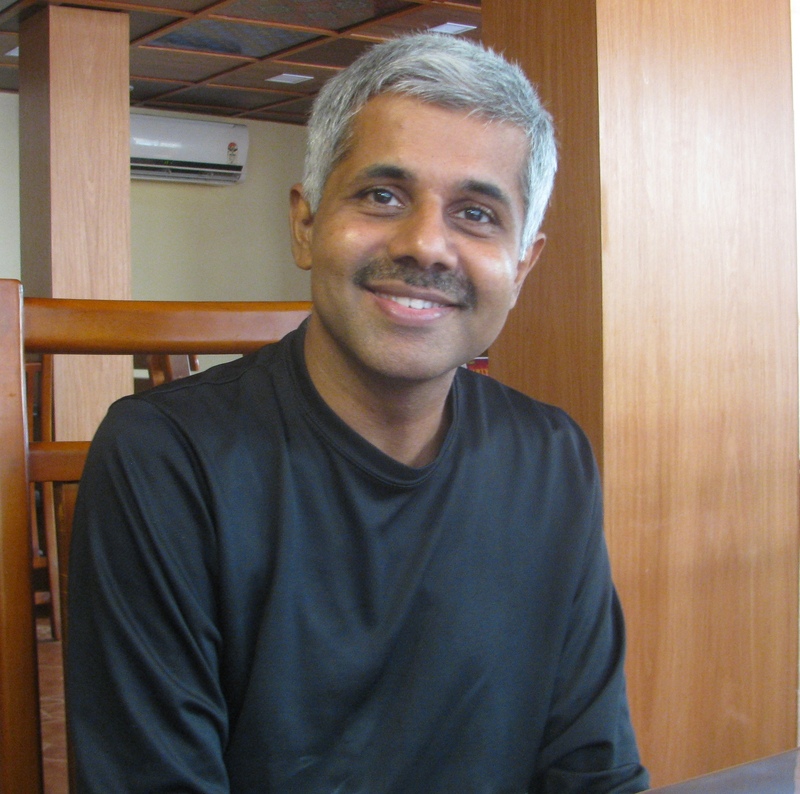 Ramesh completed the 2015 SCMM in 3:04. In 2016 he ran the Boston Marathon again, this time barefoot and completing it in 3:11:54, his best timing yet at the event. Six days later, he ran the Big Sur Marathon in California, “ one of the most scenic marathons in the world,’’ although Ramesh who ran it barefoot does not deem it ideal for barefoot running given road conditions. But it was an event he ran earlier in 2016 that set him thinking. He finished the 2016 Dubai Marathon in 3:02. It got him interested in the possibility of running a sub three-hour marathon. He knows that although a mere three minutes separates 3:02 from sub-three, getting there will be challenging. “ I can plan to push myself for a sub-three perhaps by January 2017,’’ he said. For now the Houston Marathon appears a good event to try this. In the meantime, he is trying to build up his strength and endurance. Article on Philip Earis and his many interests: science, change ringing, stepwells, solar lighting, running and a proposed seaside promenade for Mumbai. The caretaker of the premises appeared hesitant. We wanted to see the bells atop the church tower. We had read about them, the subject we were writing about knew of the bells and had mentioned it. Effort made to go up the tower and see the bells may aid the writing – so we felt. We left it at that. If we are meant to see the bells, the universe will make it happen. The bells were a unique lot. According to reports, they may have been originally meant for a British tradition called ` change ringing.’ The bells don’t work anymore the way they were intended to. Some crucial parts were never installed; some of the components have jammed through disuse. Of eight bells in there, only one has been operated in recent times. In olden days, church bells served two functions – they marked the passage of time; they brought the devout to church. Suspended high above ground in a tower, the sound of the bells was expected to travel far. But there was a limitation. Although the bell was at a height, its mouth typically faced the interiors of the tower with the result that the sound it produced wasn’t travelling out effectively. Wikipedia says change ringing started in England in the early 17th century following the invention of the `full-circle tower bell.’ This innovation allowed bells to swing almost 360 degrees from a fulcrum. The mechanism allowed the mouth of the bells to rotate up; a chime produced so traveled out from the tower. Each bell produces a different sound / strike note. What this note is depends on the size, shape and metallurgy of the bell. Every time a clapper hits one particular bell, the strike note will be the same. Change ringing is based on a sequence of permutations of different notes; thus a composition involving eight notes, requires eight bells. Hanging from the centre of a bell, the clapper takes a very small – yet measurable – period of time, to hit the bell’s metal side. 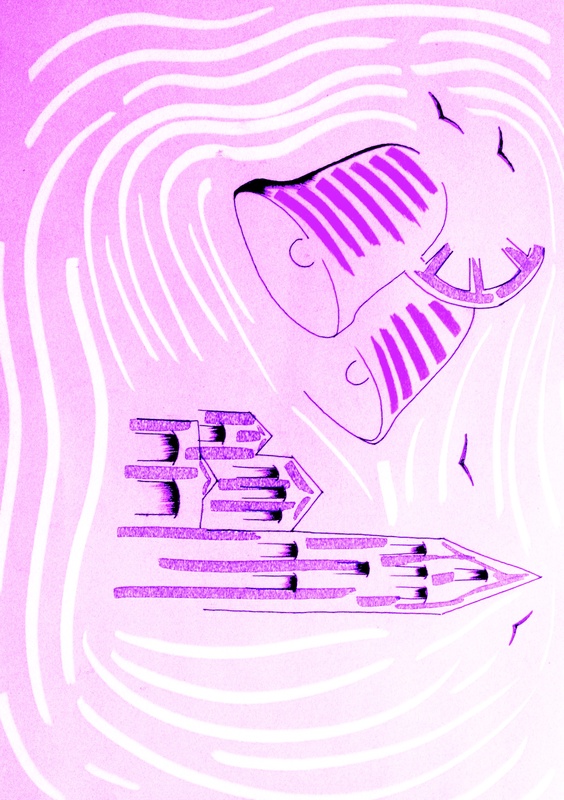 If the bell is big, located up in a tower and rung using ropes from below, then this time gap between intent in the head and actual chime must be mastered, particularly if you are creating a pattern of sounds with others ringing other bells in the tower alongside. Imagine maintaining the sequence for hours. That is the challenge at the heart of change ringing. Besides mouth-up position allowing the chime to travel far, the full-circle tower bell also provided more refined control over chiming. An idea of long aural sequences played with bells, so far imagined in the head began to manifest physically as change ringing. Change ringing is also done with smaller hand held bells. Videos of change ringing available on the Internet, show people working with bells of various sizes, the ringers knowing exactly which bell and what chime to produce for given sequence / composition. It is an activity seemingly imbued with patterns; mathematical patterns. 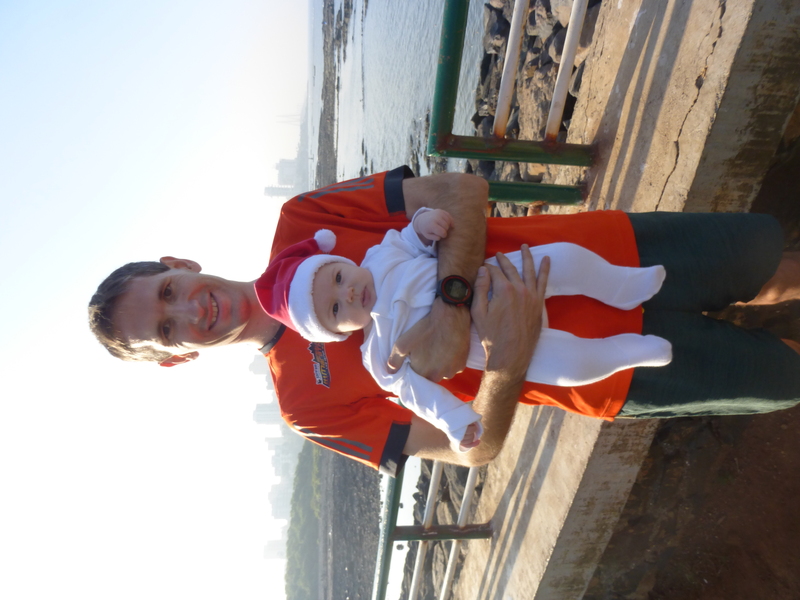 Philip with his daughter at the Joggers Park in Bandra, Mumbai; a Christmas Day. England continues to be the centre of the change ringing tradition. In tune with wherever the British went, traces of change ringing can be found across the world. Some time back, an Englishman, staying at Bandra in Mumbai, visited the church we were at and went up the tower to inspect the bells. “ Yes, yes, I know him…a tall, thin person. They just had a baby,’’ the caretaker said. 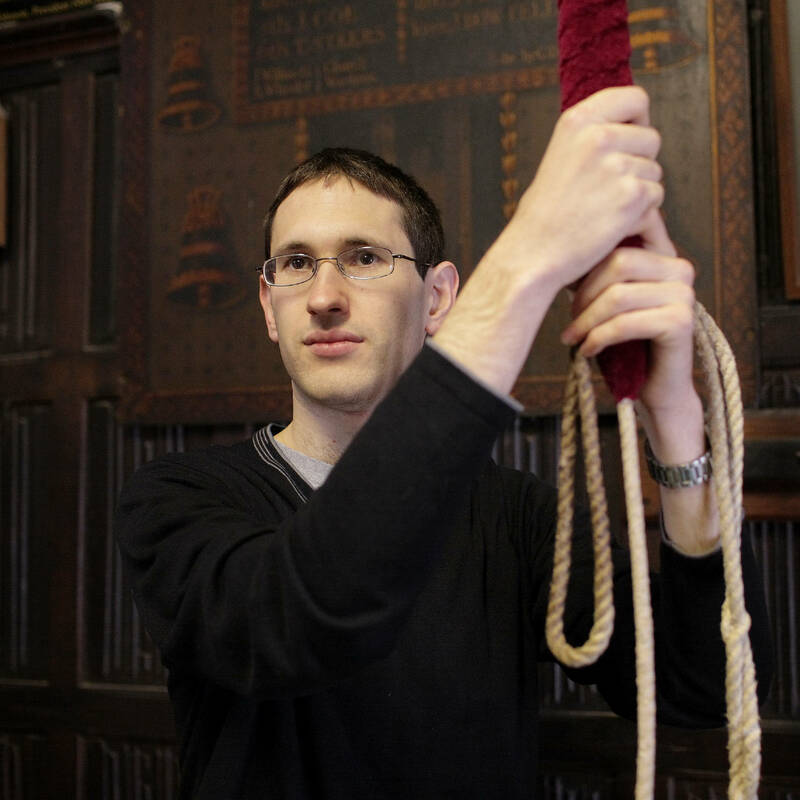 As of June 2016, Philip Earis was part of a small team that holds a world record in change ringing – the longest continuous bell ringing performance. It was done in England, with hand held bells. Philip was born in Huddersfield, a town in West Yorkshire, England. Wikipedia pegs the population of Huddersfield at 162,947 as per 2011 census. The son of a vicar and a teacher, he majored in Physics from Cambridge. “ I was enjoying science broadly, not so much in the narrow aspect,’’ he said, a morning at his apartment in Bandra. Following his studies, Philip went into science publishing. “ My role was to network with scientists and have them write for the journal I was working for,’’ he said. Philip managed a portfolio of seven journals. “ I was never into sports. I didn’t enjoy physical education in school. I did a bit of cycling – that’s all,’’ he said. Philip did try running. But he would get exhausted. Eventually a friend advised: take it easy, take up running slowly. About five to six years ago, he started running regularly, covering roughly six kilometres daily in Cambridge. What brought out the runner in Philip was probably the similarity between change ringing and rhythmic running. Both Philip and his wife, Jennifer (they met as students [she studied mathematics] in Cambridge; they got married in 2011) were into change ringing. The act of ringing a bell repeatedly with perfect timing and in harmony with others to create an enduring aural pattern requires discipline, focus and empathy for a meditative state of mind. The mind settles into a pattern punctuated by periodic change to patterns. Running is not radically different from this. Striding is a pattern; the mind visualizes a given distance overall and alters the patterns you settle into accordingly. And at the back of it all, as with sustaining the effort of bell-ringing for hours is the challenge of sustaining the running for hours over a long distance. It is mind over matter. Both are mind games. Besides Philip, another person from the world record holding-change ringing group is into running. Yet another is an avid hill walker. 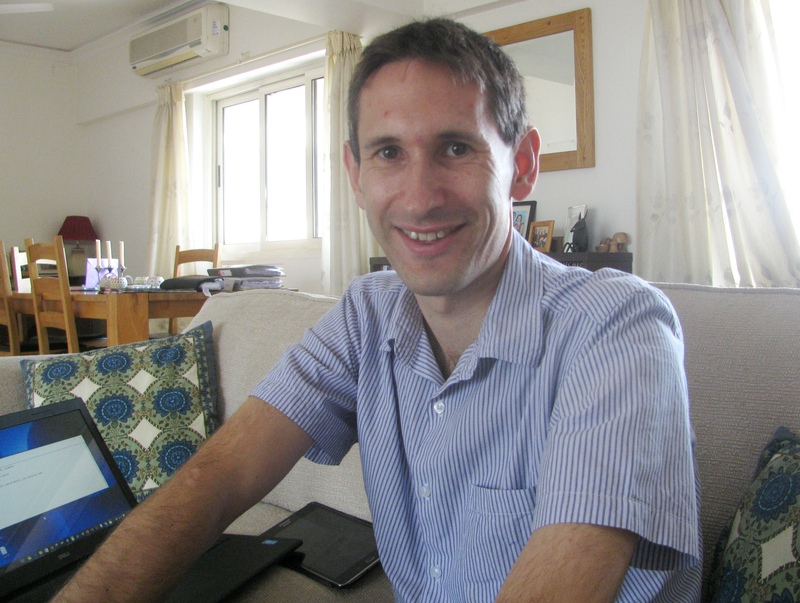 In 2013, Philip and Jennifer shifted to Mumbai, where Jennifer would start an actuary practice for PriceWaterHouseCoopers. Philip left his original publishing job. But he had in place his contact with scientists and an appetite to know better, scientists in India, even attempt solutions for local problems that he came across. “ From the outset itself, we wanted to be immersed in India. We didn’t want to be surrounded by a corporate or expat bubble,’’ he said adding, “ coming to Mumbai with a fresh pair of eyes has been helpful. I guess people have an unquestioning attitude at times. A fresh pair of eyes that way can be helpful.’’ One of the areas he got involved in was solar energy. Another area of interest was mapping the existence of stepwells in India and creating a web atlas for them (www.stepwells.org). A May 2016 article in Mid-Day said that in eight months, Philip was able to collate information on about 300 stepwells. He estimates that their total number in India should be around 1500; many of the known ones are in a state of neglect. The Archaeological Survey of India (ASI) has reportedly preserved only 46. Stepwells worked primarily as reservoirs. But given the temperature at the bottom of a stepwell was sometimes up to six degrees lower than at the top, they were also meeting places for people. Over time, depleting water table caused by overuse of ground water and ruin through neglect caught up with India’s stepwells. Many have gone dry. The state of neglect increased under British rule; they considered water from stepwells to be unhygienic. 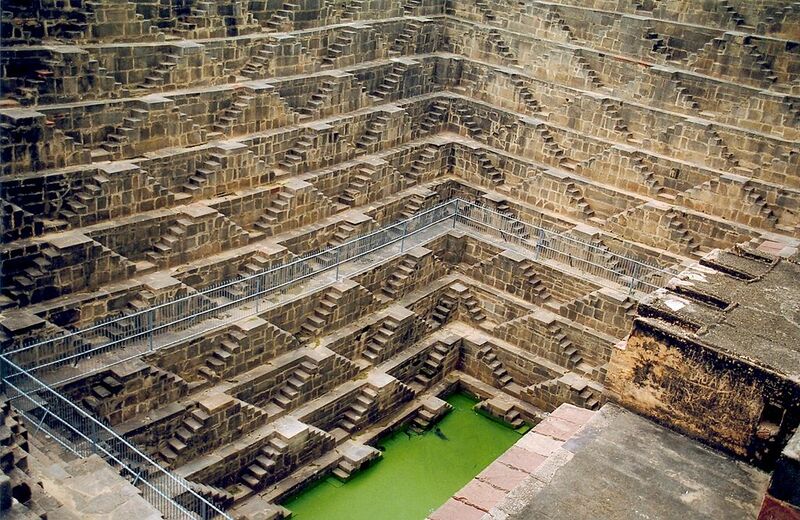 While in the article Philip has described his interest in stepwells for the Indian solution to an Indian problem (water scarcity) they are, in the context of change ringing, it is hard not to ignore the precise mathematical architecture and repetitive visual patterns that characterize a typical Indian stepwell. Change ringing generates mathematical patterns in the aural dimension. Philip described in a nutshell the change ringing world record he was part of: There were three participants, each ringing two bells, so six bells in total. With six bells, there are 6*5*4*3*2*1 = 720 different sequences where each bell rings once and once only (`permutations’), for example: 123456 or 214365 or 365241 etc. An `extent of a method’ is a way of arranging the sequences such that all 720 permutations appear once and once only. In the record breaking-performance, we rang 100 different extents of methods. According to the historical requirement for change ringing peals, all methods have to be strictly committed to memory beforehand (no memory aides are allowed) and the whole performance must be rung continuously without any hesitation or break. So the big challenge was to continuously recall a memorized sequence for 24 hours at a fast pace and without any breaks. On the first Sunday of every month, the running group, Mumbai Road Runners (MRR), have their monthly half marathon from Bandra in the suburbs to NCPA in South Mumbai. It is usually well attended. Slow, struggling runners, the authors choose to start earlier than the rest. The first of the runners coming from behind typically catch up with our huffing and puffing selves on Worli sea face. Lost to their rhythm, they overtake smoothly and proceed on, leaving writers in the dust. Among them would be Philip, now recognized as one of the finest amateur distance runners in the city, in his age group. 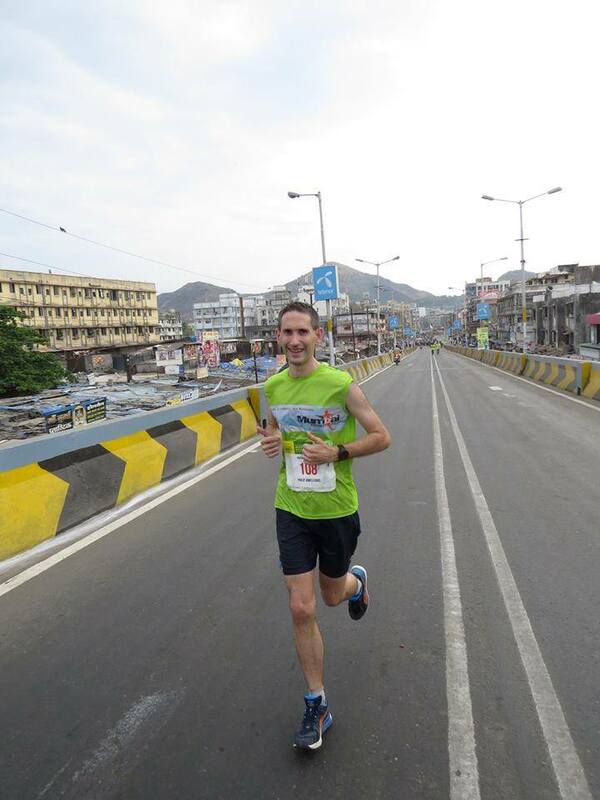 His first race in Mumbai was ` Footsteps for Good,’ a ten kilometer-run organized by the British High Commission. In 2014, he ran his first Standard Chartered Mumbai Marathon (SCMM), which was also his first full marathon. “ The first half was fine, the second half was messy. I had to do a bit of walking,’’ Philip said. He then ran the half marathon in Bengaluru in 2014, repeated the SCMM full marathon in 2015, ran the full marathon at Vasai-Virar in 2015 and the full at SCMM in 2016. In between he also ran the Mumbai Ultra, his first attempt at distances exceeding the full marathon’s length. “ I would like to run some of the longer distances,’’ he said. Fanaswadi (aka Fanaswadi-Valap) is a small dusty settlement some distance from Panvel on the outskirts of Mumbai-Navi Mumbai. In the summer of 2015, we reached Fanaswadi to meet Kamlya Bhagat. A runner hailing from poor circumstances (in 2016 he won the SCMM half marathon in his age group), he was financially challenged. During the course of the conversation, he mentioned how other runners had helped with shoes and registration fee for races. 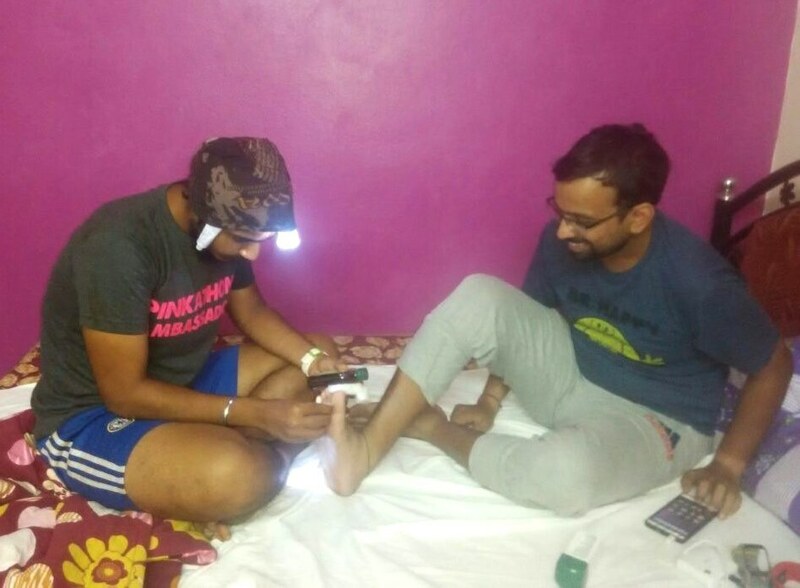 One such intervention by fellow runners could be seen in the space outside his small house and the trail leading up to it – a series of solar powered lamps. Fanaswadi didn’t have electricity. Solar lamps made sense. That was where we first heard of the English runner dabbling in solar energy; subsequent enquiry yielded the name – Philip Earis. A July 2015 article in DNA newspaper about Philip further pointed out that his work had brought lighting to slums in Worli, the Bandra Reclamation area, Gilbert Hill in Andheri and Prabalgad, a village off Panvel albeit in a direction different from Fanaswadi. In the months that followed, Philip’s name would emerge in not only such assistance provided but also in cases of introducing deserving athletes from poor backdrops to Mumbai’s running community. Dnyaneshwar Morgha is an example. 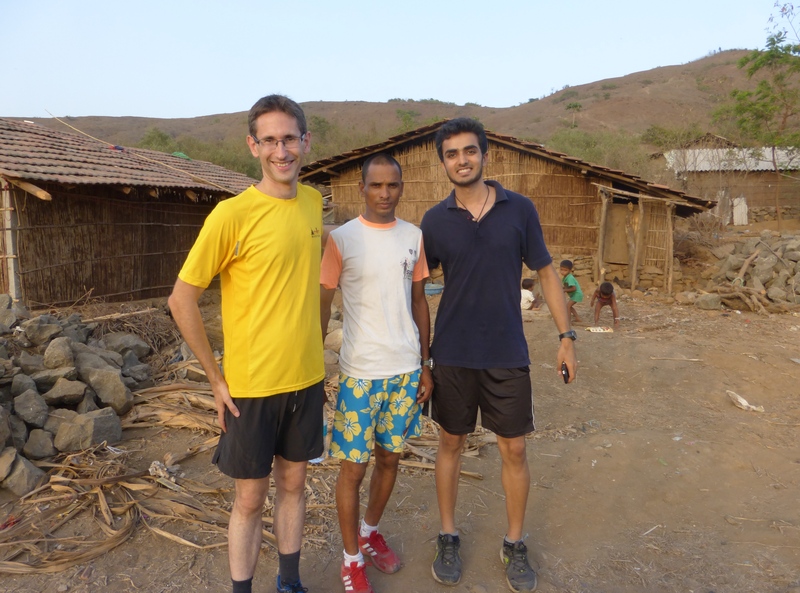 Philip described how he met Dnyaneshwar: I first met Dnyaneshwar at the end of a half marathon in Bandra in December 2014. I was originally supposed to be running in the race myself, but the day before the race the organizers phoned me up to say regretfully they were disqualifying me, and they feared any non-Indians running could be a safety risk and need extra permission etc. As the race was taking place near my apartment I went along anyway to watch and cheer on the runners. The winner was this very small and young runner, who glided along at great speed and seemingly effortlessly. His huge talent was obvious to see, and yet it was also apparent from a quick conversation with him afterwards that he had so much untapped potential – he didn’t have any coaching and wasn’t even really following a training plan. I tried to get his details but there was some mistake in the phone number, and it took me a further year to finally track him down. Philip believes that India has a lot of talent in distance running but it needs to be discovered and nurtured. Resource crunch aside, an overview of the Cambridge Half Marathon he provided, hints at the difference in running between here and overseas. Cambridge, where Philip commenced his running, had an ambiance conducive for running. Wikipedia pegged the 2011 population of Cambridge at 123,867 including 24,488 students. Having become a regular runner, Philip once participated in the Cambridge Half Marathon. “ Nearly 7000 people took part in it, which is high if you compare it with the total population of Cambridge. What’s more – the average finishing time is under two hours,’’ he said. Following Asia’s largest marathon settling in as annual event, Mumbai has become India’s running city. However, for all that reputation, Mumbai running is despite the city’s congestion and traffic. While SCMM happens once a year, events like MRR’s Bandra-NCPA run (and others of the same ilk) keep the running movement alive. Mumbai is a coastal city. On the map, the route from Bandra to NCPA would seem a run by the sea. In reality it is not so. With several million people in the city and residences, office complexes, apartment blocks and slums packed into limited area you are visibly by the sea at only four spots on MRR’s iconic monthly half marathon. You have a small bit of polluted estuary near Mahim, the Worli sea face, the Haji Ali stretch and finally Marine Drive. Unlike Mumbai, many other coastal cities have successfully maintained seaside promenades. Philip’s “ fresh pair of eyes’’ helped. In league with the Observer Research Foundation (ORF), Philip has a project submitted to municipal authorities for a long seaside promenade on Mumbai’s west coast that would be aesthetic, engaging local communities and open for running, walking and cycling. Called `BayLine,’ it visualizes a 15m-wide, 24km-long pedestrian pathway along the seashore, linking Haji Ali and Versova in the city. The proposal is rooted in the observation that 52 per cent of daily trips in Mumbai are done on foot with pedestrians accounting for 58 per cent of accident deaths – that underscores the need for pedestrian focused infrastructure, which the BayLine is. According to Philip, much of the connectivity for creating this promenade already exists. The onus of seeing BayLine through may now shift at least in part to the local running community (who along with communities residing by Mumbai’s sea coast, walkers and cyclists would be among stakeholders), for Philip Earis and family are due to return to England by mid-2016. MRR has dedicated the Bandra-NCPA run of June 5, 2016, to Philip. We asked Philip what his impressions were of running in Mumbai; what he would like to remember? He responded: My biggest impression is of the dedication and determination of runners here. Mumbai is a very hard city to run in – the heat and humidity are invariably tough, and sometimes almost impossibly so. The traffic, badly-paved surfaces, air pollution, and lack of open space and good running routes all pose many problems. And yet thousands of runners still motivate themselves to get up before dawn and incorporate running into their busy lives. The enthusiasm shown by runners – of all speeds – is inspiring. It is wonderful to see the ongoing growth in running culture in the city. My twin hopes are that this growth can both continue and ensure the running community is more reflective of the city’s population as a whole (recreational running is currently skewed towards the wealthy and well-educated strata of society), and moreover that runners can join together and make their voices heard to push for a much better deal: more open space, better runner-friendly facilities (like the BayLine), and a focus on reducing Mumbai’s dangerous levels of air pollution. The caretaker of the church listened as we said Philip would soon return to England and we needed to write an article, for which the excursion up the bell tower would help. “ Come,’’ he said. The church was closed. He brought forth a set of keys and opened the main door giving us a glimpse of the lovely interiors within. Immediately to the right of the main door was a small passageway, spiraling tightly in claustrophobic diameter to the top. It had steep steps. Roughly two floors up, the steps yielded to a rusty ladder, above which was a cobwebbed platform of steel with more stairs going up the church tower. Some bit of continued climbing and one stood right below the heavy bells, made in England over a century ago. We were inside the bell tower of Afghan Church in South Mumbai’s Colaba.